There has been an idea floating around the industry for quite a while now that video games could have merit in exploring subjects that you would traditionally see in a newspaper. These "newsgames" would be an interactive way of relaying current events to people, and in getting them to interact with the "news story" directly, the idea is that the player would become more personally engaged with it, and therefore the information would sink in better. Related reading: An interview with a game developer heavily involved in the newsgame and games-for-change space. We're still a fair way away from newsgames becoming even remotely a commonplace idea. Among other things, they take a lot of work and journalists don't know how to build games, both of which are inhibiting newsgames from really realising their potential. But the occasional experiments that we are encountering are interesting, to say the least. PeaceMaker is one such experiment, and it is indeed interesting. 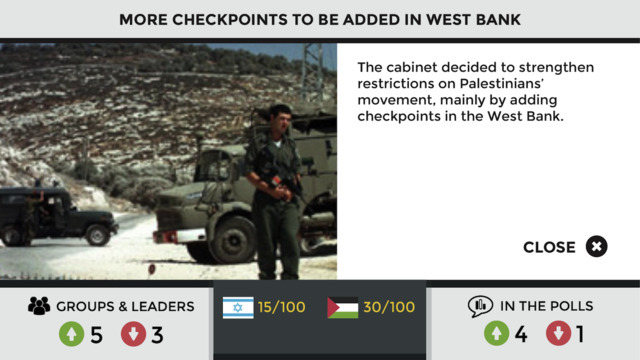 The game is focused on the long conflict between Palestine and Israel; as politically loaded as game topics come, to be frank, and it's amazing that Apple ever approved this for release (the company generally shies away from allowing games that focus on real-world national conflicts... and has even tried to ban the United States' Confederate flag from simulations of the American Civil War). But it’s good that the game made the cut. 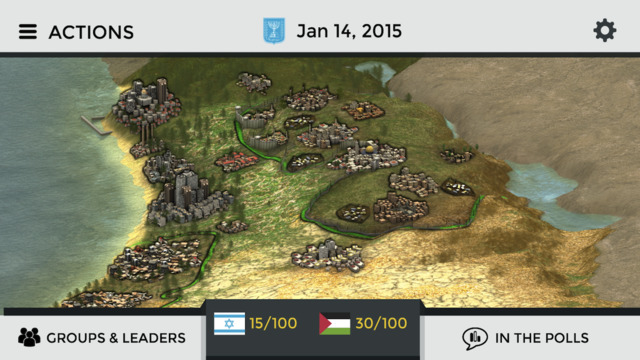 While it’s a very simple simulation game, it is also remarkable piece of educational entertainment; both in highlighting the very real challenges the region faces today, and the history that led to it. As a game, it is exceedingly simple. And it's worth noting that it's a port of a game from back in 2007, so it's showing it's age quite sharply now. What you need to do is broker peace between Israel and Palestine, and you do that by managing the conflicting interests of extremists and moderates in both nations, as well as foreign interests such as the UN, United States and European Union. This is achieved by making a series of decisions in a turn-based fashion around infrastructure projects, military development and diplomacy. So for example you might opt to conduct a rousing speech to the UN, which goes down just dandy with the United States, but at the expense of your reputation with the hardliners back at home. You might be able to then apply to the US for a loan to finance an infrastructure roads project, which makes your people happy and improves the economy, but sours the relationship with the other side that you're trying to make peace with. You can play the game as Israel or Palestine, but in both cases it is intensely difficult to balance out all the conflicting interest and achieve peace. And that’s the point. If peace between Israel and Palestine was easy to achieve, someone would have managed to broker a deal so far. It would be almost too easy to say “well, why is it not that easy?" Because that's what we do in modern political debate; we assume that because we have a layperson's opinion we can fix everything. 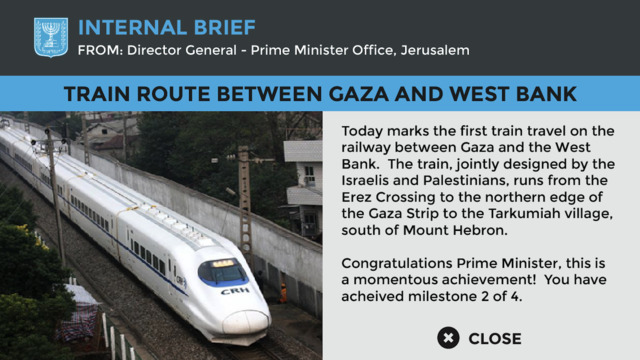 And that’s where Peace Maker’s ability to set context is so powerful; the game uses a mix of real footage, photos, and events to also explain to people the long history that has caused such a divide in the region. A fair amount of this information will be new to most people, I suspect. 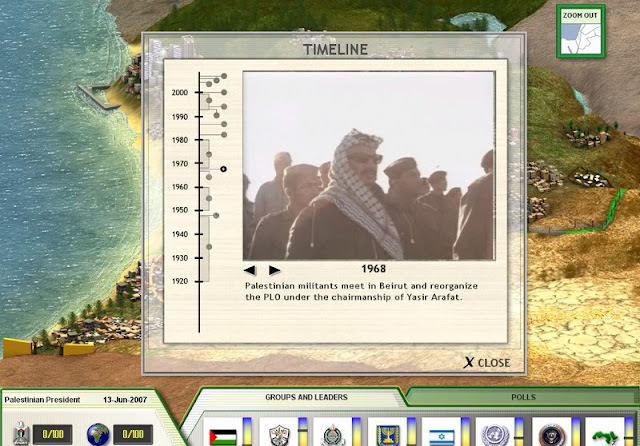 I like to think of myself as fairly well informed on tensions in the Middle East, but I found that this game improved my background knowledge of the region's political past. The video footage is the presentational highlight of the game; it’s got a strong message to pass on, but limited resources to do so. If newsgames do take of as I hope, then we can expect this will be a fairly common recurrence; functional menus and interfaces make for a game that is perfectly easy to navigate around, but in no way standout. In fact, a little like in actual newspapers, ease of access to the content is more important than how aesthetically pleasing it is. Still, the map of the region that sits in the background helps to geographically place what’s going on, for people who are less familiar with the region, and that’s useful in its own right. There’s the odd moment where some inconsistencies let PeaceMaker down as a game. For example, in one instance I negotiated with the Fatah group to improve law and order in the region. The game told me that the negotiations were successful and Fatah responded well to them, only for the series of icon that showed the impact that the move had reported a decline in relations with Fatah. Related reading: For people interested in a more traditional example of simulation fun on their mobile devices, check out the excellent Transport Tycoon. Those inconsistencies really let down a game that otherwise rests its heart and soul on being a realistic and authentic experience. It's still very worthy, and as an early example of the newsgame genre I think this is a shining example of what the genre can - and should - be.